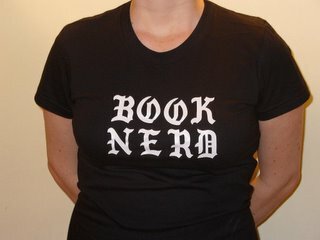 I love that people send me articles about books, bookstores, book technology, and other stuff they know I might be interested in for the blog. My friend Steve sends me the best of the gazillion articles he reads about ebooks. The ALP sends me articles about comics. And sometimes my mom sends me articles about bookstores. Thanks, guys -- I read them all, though I don't always have time to talk about them. Speaking of time, if you've got any this Saturday and Sunday, check out the Indie & Small Press Book Fair at the New York Center for Independent Publishing. As the Times notes, the sessions include musicians as well as authors and publishers, and the conversations should be as wide-ranging as the books on offer. But that display will have to wait until January, because the bookstore is currently crammed to the gills with Christmas books. In terms of the War on Christmas (thanks Noelle for the link to weirdness), I think "Happy Holidays" is a more thoughtful and kind greeting in a diverse city, and the one I use with customers; but myself, I love Christmas, and all the wrapping paper and cards and festive gifty books are making me a bit giddy. The ALP surprised me this morning with a brand-new stocking for our first Christmas together, and a gingerbread house kit. I'm reserving all of my favorite Christmas books at the library, and compiling my mental list of recommendations for customers and book gifts for my own loved ones. And in what feels like a very nice pre-Christmas gift, my presentation of my bookstore business plan to the judges at the Brooklyn Business Library went extremely well on Wednesday. Since I spend a lot my time thinking and talking about the viability of indie bookstores and the great opportunities in Brooklyn, answering their questions was pretty easy, and I felt especially confident and articulate -- of course, it was a book-loving crowd, so they were on my side. Thanks to all of you who were mentally supporting me! Now I just have to wait until the end of January to find out what they really thought. Good thing there's plenty to think about in the meantime. And of course, I'd be remiss if I didn't mention our fabulous ELNO at HousingWorks on Wednesday night. About 30 booksellers, publishing folks, and authors were in attendance, publishers generously donated reading copies (the remainders went to HousingWorks, of course), and good bookish conversation was had by all. Thanks to all who attended -- see you again soon. Happy Friday -- enjoy your weekend, and happy reading! I've resolved to do more book reviewing around here, if in smaller snippets. As with all of my favorite books, this is one of those that totally absorbs you into the plot during the reading of it, but leaves you with a great deal to ponder afterward. The two heroes of the plot are an African Jew and a Frankish Jew, in the messy period between the Roman Empire and the late Middle Ages, in the messy region between Europe, the Middle East, and Asia, in the messy (but classic!) position of being cheerfully self-serving con men who find themselves in the midst of an epic and moral struggle. At stake is Khazaria, a real-life Jewish kingdom that lasted 400 years -- and there are a lot of disguises, swordplay, grand speeches, bittersweet romance, elephants, surprising turns of fortune, blood and fire, colorful bit players, and witty remarks before it's all sorted out. Much of my after-musing on this book has been about the overlaps and mixing of cultures we think of as separate, and about the great stretches of history before, say, the year 1500 that we almost never think about. Along with spending Thursday morning reorganizing the literature section at the bookstore, reading this irresistible story stoked an appetite for thinking about nationality, ethnicity, history, geography, and how infinitely complex the world is. "Adventures are a logical and reliable result -- and have been since at least the time of Odysseus -- of the fatal act of leaving one's home, or trying to return to it again. All adventure happens in that damned and magical space, wherever it may be found or chanced upon, which least resembles one's home. As soon as you have crossed your doorstep or the county line, into that place where the structures, laws, and conventions of your upbringing no longer apply, where the support and approval (but also the disapproval and repression) of your family and neighbors are not to be had: then you have entered into adventure, a place of sorrow, marvels, and regret. Given a choice, I very much prefer to stay home, where I may safely encounter adventure in the pages of a book, or seek it out, as I have here, at the keyboard, in the friendly wilderness of my computer screen." The extension of that thought, of course, is that the place to which one adventures can also become home -- for better or worse. As the ALP and I prepare to spend our first Christmas together in New York, away from our families, home and adventure and history have been on my mind. I think I might give this book to a lot of people as a Christmas gift -- everyone should have the chance to leave home so definitively as I did in traveling to Khazaria with the gentlemen of the road. What about you, dear readers? What have you read lately that has been an adventure? My occasional column in Shelf Awareness on "graphic lit" ('cause they're not all comics, and they're not all novels... but I'm pretty okay with all terms, interchangeably) ran yesterday, with my suggestions for gift-worthy graphic lit. There's an abundance of delicious new and collected comics out there this season, and this is just a small sampling. One of the titles I didn't get to include is the first and second collection of Moomin, the comic strip by Tove Jansson featuring an endearing hippo-like creature and friends. Whimsical and surreal, childlike and socially conscious, bizarre and totally intuitive, the strip has tremendous appeal -- but since I've only read it in bits and pieces (while I probably should have been doing other things) on the sales floor, I can't say I've experienced the whole thing. It's one of the gifty new collectios that works for kids and adults, so I thought I'd throw it in as a bonus for you blog readers. Speaking of brilliant gift books -- I was gifted the new Poetry Speaks Expanded by a pal at SourceBooks, and the ALP and I spent a lovely evening trolling through the CDs and the book listening to our favorite serious and silly poets reading their work. There's a lot of overlap with the original Poetry Speaks (which was one of the ALP's first gifts to me, back in 2001), but the new edition has a lot more poems printed and recorded. What an incredible gift for a poetry lover, I think. Off to work, for tomorrow we feast! A very happy Thanksgiving to everyone -- and here's hoping Friday is very black indeed in all indie bookstores. So maybe you remember me mentioning the Brooklyn Business Library's business plan competition, which I entered with a crazy plan for an independent bookstore in Brooklyn. The winner of the competition gets $15,000 to use toward starting up their business, and runners-up get lesser financial prizes or service packages from local vendors. I still have a presentation to make to a panel of judges on the 28th (which sounds like a cross between a dissertation defense and those prepared speeches I did in junior high), and there's no guarantee I'll take home the prize or even a secondary one. But what an incredible confidence booster it has been to realize that it's not just fellow book nerds who are enthusiastic about this idea. There are some Brooklynites out there who don't think I'm completely nuts, too, and allow for the possibility that I might have something to bring to our community. I'm grateful, and newly excited about the future. Speaking of community, I'd like to officially invite all you younger booksellers and publishing folks to our fourth (or fifth?) quarterly ELNO - Emerging Leaders Night Out. This is your chance to meet others of your age and outlook who work in the field of books. Network, mingle, throw your head back and laugh engagingly, or just look around and realize that you're not alone. The shindig will be held Wednesday, November 28, from 7 to 9 PM at the beautiful HousingWorks Used Book Cafe on Crosby Street; visit HousingWorks' website for directions. It costs nothing to get in, and HousingWorks is offering happy hour prices on beer from its cafe all evening. And rumor has it there will also be some comp copies of books donated by publishers for young booksellers, and perhaps even some authors to class up the joint. You can email me here if you have questions or you want to RSVP. And learn more about Emerging Leaders here. Hope to see you at the bookstore! 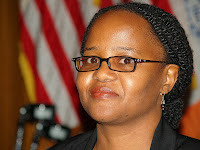 Haitian novelist and memoirist extraordinaire Edwidge Danticat was a finalist for the 2007 National Book Award for her most recent book Brother, I'm Dying; you can read an interview about her book and the nomination here. A few weeks before the awards, however, Danticat was gracious enough to talk a bit about her childhood in Brooklyn. Though Danticat no longer lives here, the borough's literary culture is a little bit richer for having her. It’s a book called Brother, I’m Dying, a family memoir. My father moved here when I was 2 and my mother when I was 4. They left me in Haiti with my aunt and uncle while getting settled here. With immigration red tape it took us 8 years to be reunited in Brooklyn when I was twelve years old. Brooklyn is like a microcosm in the world. So many people from Brooklyn come from somewhere else, even somewhere else in the United States. Brooklynites are feisty and strong and proud. I meet people all the time from all over the world who have some type of connection to Brooklyn and they are always very proud of it. I grew up in East Flatbush which was a very Caribbean neighborhood. You could/can find spices and foods there that you can find in Port-au-Prince, or Kingston. That made it feel even more like home, in spite of the cold winters. Also the labor day Caribbean festival is unmatched in its scale in the States. It’s a wonderful carnival that we all participated in from my community and others. Paul Auster has it. Sapphire, Gloria Naylor Paule Marshall, Jacqueline Woodson, Jonathan Safran Sofer [sic], Jonathan Lethem of course are all emblematic Brooklyn writers. But we have wonderful writers too who even though they’re not writing about Brooklyn yet are now part of the fabric, writers like Jhumpa Lahiri and other more recent Brooklynites. Brooklyn lacks the craziness of having to be all business all the time publishing wise, plus it offers a community. I think that’s very appealing to writers. The Brooklyn public libraries have some great liteary events. The Brooklyn book festival is fabulous. I’ve never seen that many people at a book event in Brooklyn. BAM is a great treasure, our own Lincoln Center with edge. There are also a slew of smaller event within the different ethnic communities that are very exciting. Nkiru Books when it existed was great. It was a great independent that brought wonderful writers like that. More small independent bookstores would be great. Thanks so much to Jay Baron Nicorvo for inviting me to participate in the CLMP/LWC this weekend (that's Council of Literary Magazines and Presses - Literary Writers Conference for you acronym buffs). I had a great time in the "Power of Blogging" panel with Ron Hogan (of Beatrice and GalleyCat) and BethAnne Patrick (of PW's BookMaven). Though I felt a bit outclassed -- I found out Ron has been blogging since the dark old days of 1995, and BethAnne actually gets paid to blog (though I wouldn't recommend anyone try to make her conform to some corporate idea of what she ought to be writing -- she's got opinions and chutzpah to spare!) I'm tickled to have had the opportunity to talk with them, and I hope we were of some help to the writers in attendance, who struggle (just like booksellers) with how to incorporate blogging into the world of the written word. If you don't have plans for this evening, and you're in the New York area, may I recommend Between the Lines at the Brooklyn Academy of Music? It's a partnership between BAM and the great literary magazine A Public Space, and brings together innovative writers and filmmakers for a one-of-a-kind evening of collaboration and exploration. My colleague Tom Roberge helps run the series, which is a great recommendation for it -- check it out!